Tributes have been paid to former Fianna Fáil TD Jackie Fahey who has died aged 91. He was first elected to the Dáil for the Tipperary South constituency at the 1965 general election, before later representing the Waterford constituency from 1977 for 15 years. Mr Fahey was appointed a Minister of State in the Department of the Environment, from 1979 to 1981, in Charlie Haughey's Government. He also served on Waterford County Council for 45 years. He was first elected to the council at the age of 21. 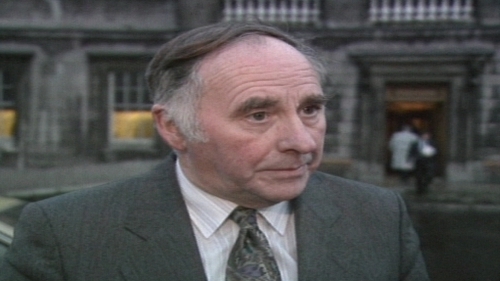 The former Minister of State was born in Clonmel in Co Tipperary in 1928. The Fianna Fáil leader Micheál Martin has expressed his sympathy to his family and friends. "Jackie lived a life of public service and represented the people of his constituency at both a local and national level," said Mr Martin. He also said "he served with great commitment and diligence through many turbulent times."